February is Teen Dating Violence Awareness Month and AWP will be part of events and movements to help bring awareness to what the youth of this country . With the help of our Young Adult Advisory Board (YAAB) we will be working to help adults speak to teens about the relationships in their life, help teens learn the proper ways to handle abuse in relationships, and what is and isn't healthy in relationships. On February 14th (Valentines Day) there is a campaign that is a part of Teen Domestic Violence Awareness Month called #Orange4Love. It is a movement to promote healthy relationships for all young people. Valentines Day seems like a hard day to consider intimate partner violence but it is actually the best day because true love is kind, respectful, and never abusive. Red might be the usual color for Valentines Day but perhaps consider wearing orange this year to show your support! 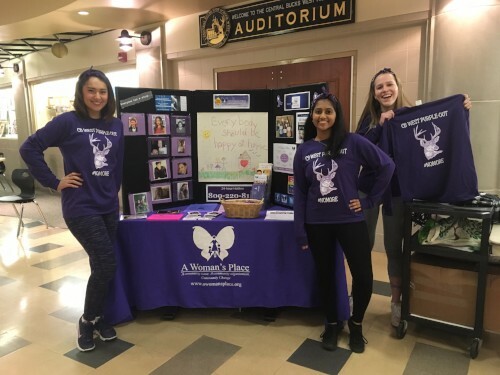 Central Bucks West High School recently held a Purple Out game to show support for Teen Dating Violence Awareness Month and to bring awareness to intimate partner violence. The teams wore purple socks, and shirts were sold at the door for fans. It was a great success and we are so very proud of the community that helped show their support. Not to mention all of the wonderful volunteers from our own Young Adult Advisory Board (YAAB) who helped organize and put together the event!